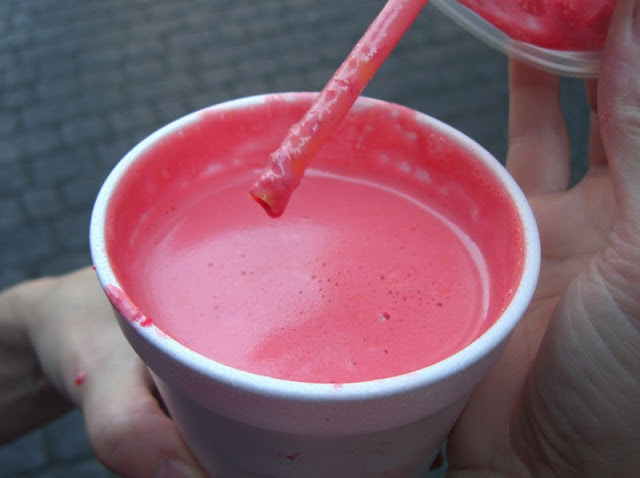 One of the things we love about Mexico is the ubiquitous availability of fresh juice. It is truly wonderful to be able to have an inexpensive, freshly squeezed orange juice any time and place that you want. But there is a world of juice out there beyond the simple orange. All flavors of fruit, alone or in combination, and vegetable juice as well. Pictured above is one of the more interesting combos - the Vampiro. It is a blend of (I think) beet, carrot, celery and orange. The reason for the name should be obvious from the picture. Not something I'd drink every day, but an interesting alternative. I love Vampiro Juice. It's surprisingly sweet. We would have the drink daily in Puerto Morelos, Mexico in the Riviera Maya just South of Cancun.